Mark Hamill, Harrison Ford, Carrie Fisher, Peter Cushing. Original one-sheet mylar movie poster. 10th anniversary poster produced by Killian enterprises. Size: 27 x 41 inches. Condition: near mint-mint and unused. 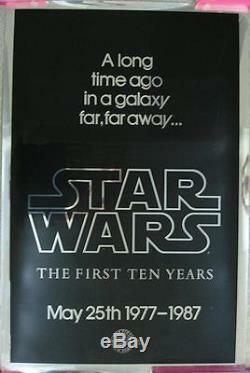 The item "STAR WARS (1977) ORIGINAL MOVIE POSTER 10TH ANNIVERSARY MYLAR ROLLED" is in sale since Monday, April 24, 2017. This item is in the category "Entertainment Memorabilia\Movie Memorabilia\Posters\Originals-United States\1990-99".